Yep, started an article with an Einstein quote, deal with it. But seriously, that quote could not be more perfect for Erik Brannstrom, Zach Whitecloud, and Nic Hague. Prior to the suspension of Nate Schmidt, the Golden Knights appeared to have a bit of a logjam of defensemen which was going to make it nearly impossible for a waiver exempt player to win a job out of the training camp. 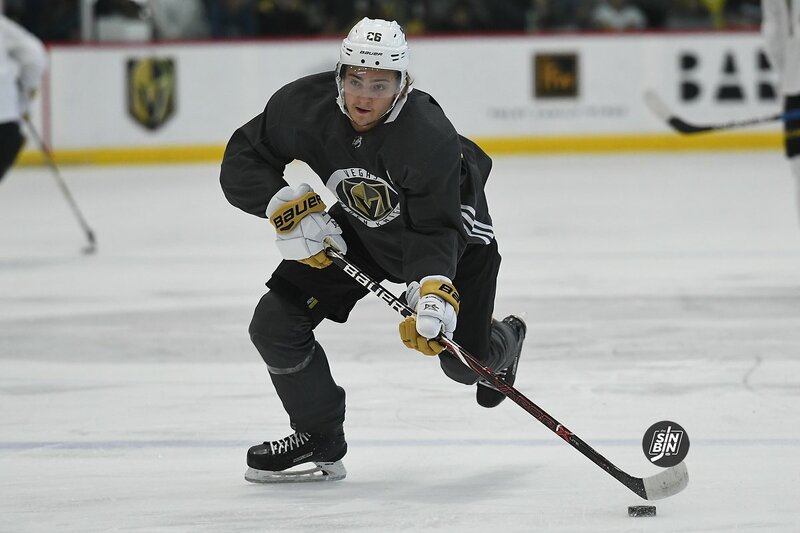 However, with Schmidt out 20 games, and the potential of Shea Theodore missing games due to contract negotiations, all of a sudden at least one spot appears to be wide open for one of the Golden Knights young blueliners. Whitecloud is the obvious leading candidate to claim that roster spot being the eldest of the trio and having spent over three months with the team during the playoff run a year ago. Whitecloud is also a physically mature 21-year-old who plays a fairly responsible defensive game suitable to fit into an NHL roster. That being said, Brannstrom and Hague suddenly enter camp with a much more realistic shot of sticking in Vegas rather than heading to Chicago come October 4th. Brannstrom will have to prove he’s trustworthy and isn’t the insanely high risk-reward player we’ve come to know him as, and Hague will have to prove he can skate with NHL caliber wingers. The question will come down to usage. In order to make it worthwhile for any of these three players to be on the NHL roster, they’ll have to prove they should be in the lineup, not just on the team. There’s no sense in putting a waiver-exempt player in the press box when he could be developing in the AHL. Unlike the scenario Alex Tuch and Shea Theodore found themselves in last year, where despite clearly being among the top 23 players on the team they were not given spots on the NHL roster, Whitecloud, Brannstrom, and Hague (and you can throw in Coghlan, Bischoff, and Oligny if you please) simply have to prove they’re good enough to play in the NHL and they’ll be on the roster. It’s a tall task, no doubt, but this year is a lot different than last year… at least for the defenseman. Sorry, Cody Glass, Nick Suzuki, Lucas Elvenes, and Tomas Hyka the forward spots are almost certainly not going to anyone with waiver-exempt status. Hague needs a ton of work on his skating. He was turned inside out numerous times at the rookie camp, at the NHL level it will be a Ninja Blender! Don’t rush these kids, let them mature at a reasonable pace. These young guys are all waiver exempt so unless they out play Merrill or Hunt they probably will not make the cut. It’s better for them to get playing time in the AHL or juniors then not even dress in the NHL. Any of these guys can be moved up or down if there’s an injury without having to clear waivers. There are a lot of forwards that are not waiver exempt. The Schmidt suspension will probably be an advantage for one of these forwards. I guy that would of normally been put on waivers now has a 20 game trial to prove that the team cannot live without him and that they need to put a Dman on waivers.